This j-channel siding looks great and lasts long. Weighs 1.4 lbs, but its lightweight power is unmatched. 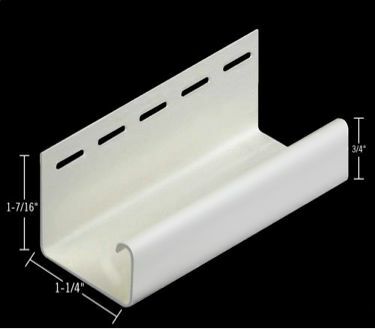 1 1/4 Inch J - Channel White (40/BOX) The J-Channel is used for receiving siding along doors, windows, eaves and the edges of gables.